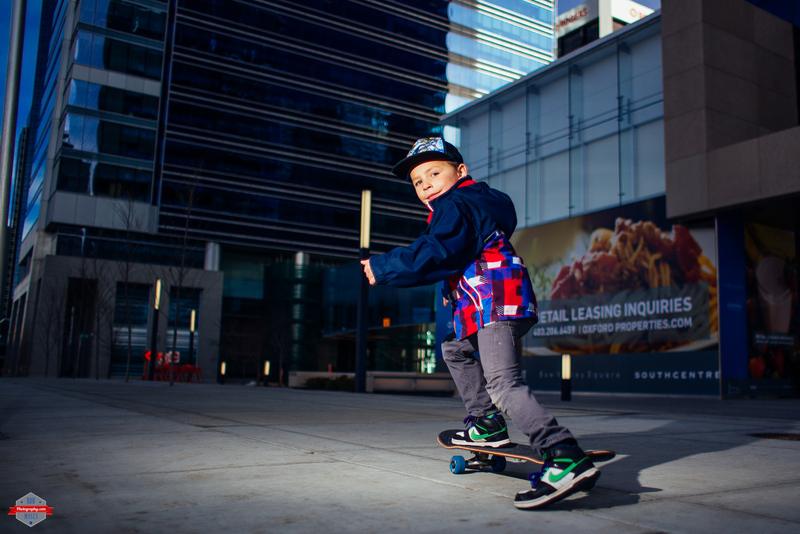 On Saturday afternoon my 6 year old son Cameron and I went for a little skate downtown. We were heading to the very popular Peace Bridge to get a shot of Cameron on his skateboard in the middle of the bridge. However, when we got there the wind was blowing like crazy and it was kind of a bad scene. 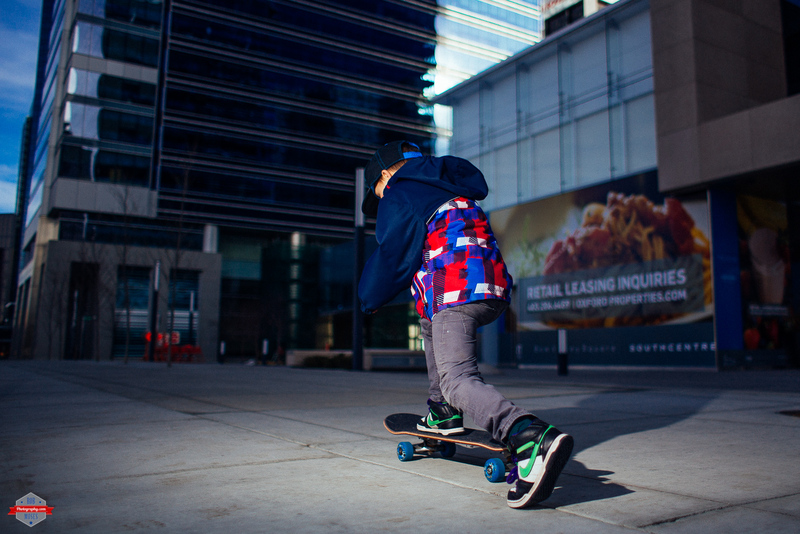 We decided to hit the streets in search of a new spot to shoot a photo. We found a spot with smooth cement, places to leave our gear and set up our cameras with very little interruption from passerbyers. Not only did we shoot photos, but we were also rolling video on the whole thing for my vlog. I didn’t realize how many times I had Cam push off on his skateboard for the photo until I was going over the video footage at home. I didn’t count how many times he did it, but it was a at least 30 times! For a 6 year old to have that kind of patience on a photo shoot is amazing. I also noticed he took direction very well. I was super impressed by all of this at the time, but even more so after the fact. I think he’d make a good little actor or model if he wanted to go down that road. For now I think we’ll just stick to the skateboarding though ;). Click photos to view in a larger size. 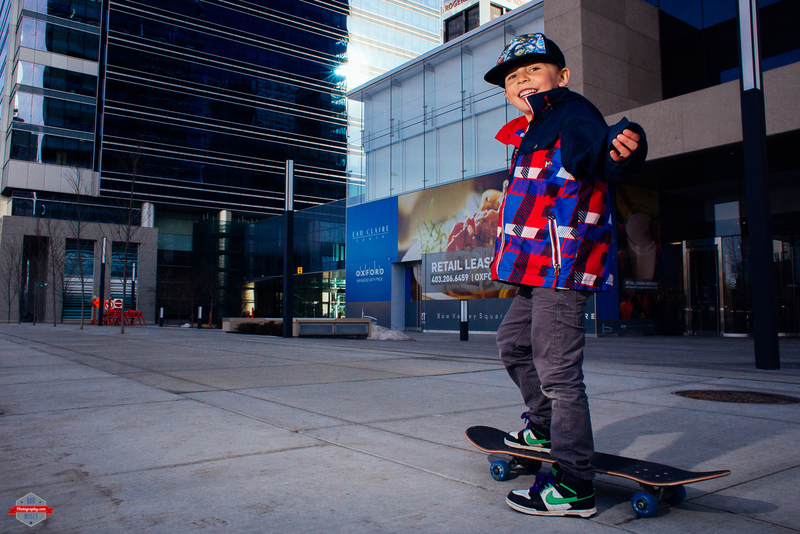 This entry was posted in People, Portraits, Sports, Video, vlog and tagged 28mm, 580EX, 580exii, 6 year old, 6D, Alberta, beautiful, Boys, buildings, Calgary, Canada, Canon, child, children, city, city kid, City Life, cute, downtown, explore, flash, flash photography, gorilla, kid, kids, lighting, manfrotto, metro, Native American, Nike, Nike SB, off camera flash, Peace Bridge, photo, Photographer, Photography, PJ790, Plan B, portrait, Powell, prime, radio trigger, remote trigger, sidewalk, skateboard, skateboarder, skateboarding, skater, sony, speedlite, Spokane Chiefs, spring, street skating, the future, Tlingit, TMNT, tripod, Urban, video, vlog, vlogger, vlogging, Volcom, winter, yyc. Bookmark the permalink. wow, great shots and what a trooper he was! For sure hey! 😀 thank you! He is a cutie, for sure! 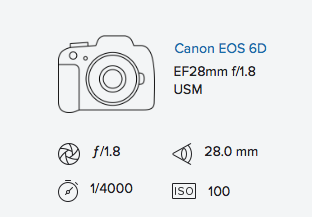 Great shots, Rob. Great shots! I had the opposite situation when my son was younger. He wanted me to shoot video of him skating and of course we had to keep going until he landed the trick (and I got decent footage of it). 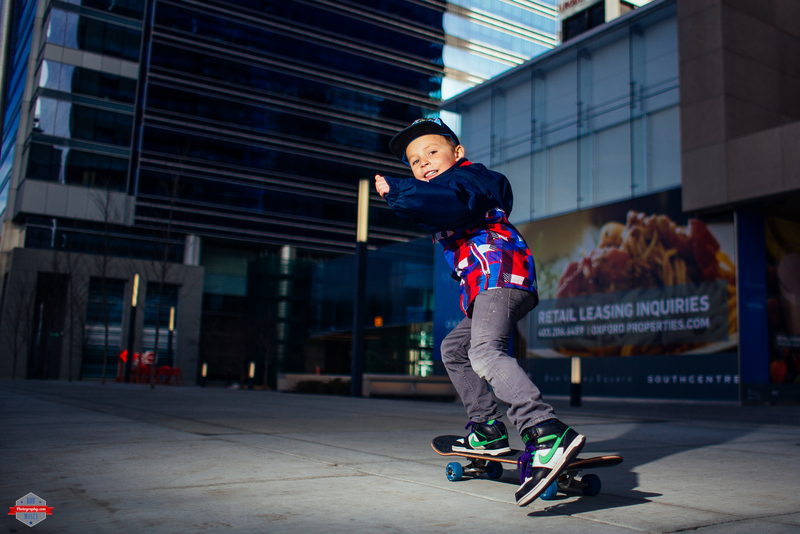 I don’t think I was such a trooper as your son, and I was so glad when my boy-child found other skaters to film him! Cameron is a cool little dude. He was a great model. Loved the Vlog! I’m sitting here with a big grin on my face – love the energy and fun in this one!